For the past few weeks, the Hindu public of Madras have been most eagerly expecting the arrival of Swami Vivekananda, the great Hindu monk of world-wide fame. At the present moment his name is on everybody's lips. In the school, in the college, in the High Court, on the marina, and in the streets and bazars of Madras, hundreds of inquisitive spirits may be seen asking when the Swami will be coming. Large numbers of students from the mofussil, who have come up for the University examinations are staying here, awaiting the Swami, and increasing their hostelry bills, despite the urgent call of their parents to return home immediately. In a few days the Swami will be in our midst. From the nature of the receptions received elsewhere in this Presidency, from the preparations being made here, from the triumphal arches erected at Castle Kernan, where the "Prophet" is to be lodged at the cost of the Hindu public, and from the interest taken in the movement by the leading Hindu gentlemen of this city, like the Hon'ble Mr. Justice Subramaniya Iyer, there is no doubt that the Swami will have a grand reception. It was Madras that first recognised the superior merits of the Swami and equipped him for Chicago. Madras will now have again the honour of welcoming the undoubtedly great man who has done so much to raise the prestige of his motherland. Four year ago, when the Swami arrived here, he was practically an obscure individual. In an unknown bungalow at St. Thome he spent nearly two months, all along holding conversations on religious topics and teaching and instructing all comers who cared to listen to him. Even then a few educated young men with "a keener eye" predicted that there was something in the man, "a power", that would lift him above all others, that would pre-eminently enable him to be the leader of men. These young men, who were then despised as "misguided enthusiasts", "dreamy revivalists", have now the supreme satisfaction of seeing their Swami, as they love to call him, return to them with a great European and American fame. The mission of the Swami is essentially spiritual. He firmly believes that India, the motherland of spirituality, has a great future before her. He is sanguine that the West will more and more come to appreciate what he regards as the sublime truths of Vedanta. His great motto is "Help, and not Fight" "Assimilation, and not Destruction", "Harmony and Peace, and not Dissension". Whatever difference of opinion followers of other creeds may have with him, few will venture to deny that the Swami has done yeoman's service to his country in opening the eyes of the Western world to "the good in the Hindu". He will always be remembered as the first Hindu Sannyâsin who dared to cross the sea to carry to the West the message of what he believes in as a religious peace. 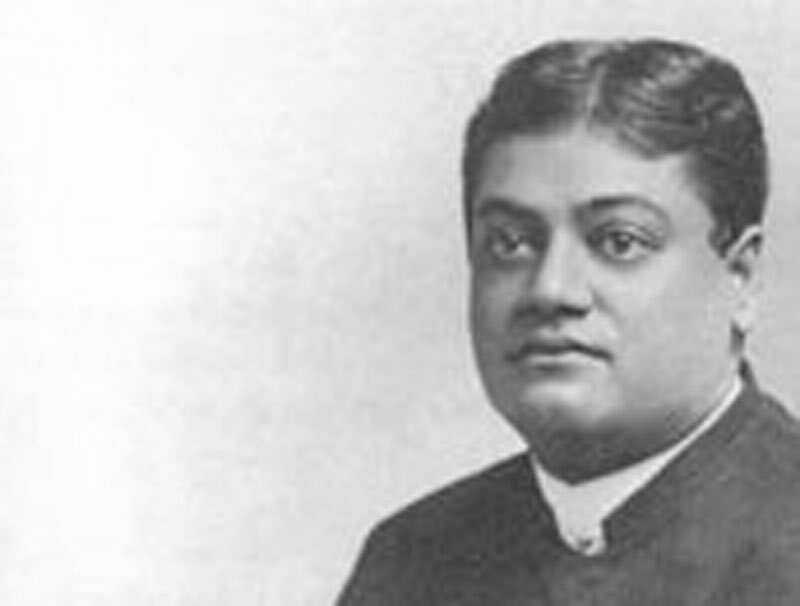 A representative of our paper interviewed the Swami Vivekananda, with a view to eliciting from him an account of the success of his mission in the West. The Swami very courteously received our representative and motioned him to a chair by his side. The Swami was dressed in yellow robes, was calm, serene, and dignified, and appeared inclined to answer any questions that might be put to him. We have given the Swami's words as taken down in shorthand by our representative. "May I know a few particulars about your early life?" asked our representative. The Swami said: "Even while I was a student at Calcutta, I was of a religious temperament. I was critical even at that time of my life, mere words would not satisfy me. Subsequently I met Ramakrishna Paramahamsa, with whom I lived for a long time and under whom I studied. After the death of my father I gave myself up to travelling in India and started a little monastery in Calcutta. During my travels, I came to Madras, where I received help from the Maharaja of Mysore and the Raja of Ramnad." "What made Your Holiness carry the mission of Hinduism to Western countries?" "I wanted to get experience. My idea as to the keynote of our national downfall is that we do not mix with other nations — that is the one and the sole cause. We never had opportunity to compare notes. We were Kupa-Mandukas (frogs in a well)." "You have done a good deal of travelling in the West?" "I have visited a good deal of Europe, including Germany and France, but England and America were the chief centres of my work. At first I found myself in a critical position, owing to the hostile attitude assumed against the people of this country by those who went there from India. I believe the Indian nation is by far the most moral and religious nation in the whole world, and it would be a blasphemy to compare the Hindus with any other nation. At first, many fell foul of me, manufactured huge lies against me by saying that I was a fraud, that I had a harem of wives and half a regiment of children. But my experience of these missionaries opened my eyes as to what they are capable of doing in the name of religion. Missionaries were nowhere in England. None came to fight me. Mr. Lund went over to America to abuse me behind my back, but people would not listen to him. I was very popular with them. When I came back to England, I thought this missionary would be at me, but the Truth silenced him. In England the social status is stricter than caste is in India. The English Church people are all gentlemen born, which many of the missionaries are not. They greatly sympathised with me. I think that about thirty English Church clergymen agree entirely with me on all points of religious discussion. I was agreeably surprised to find that the English clergymen, though they differed from me, did not abuse me behind my back and stab me in the dark. There is the benefit of caste and hereditary culture." "What has been the measure of your success in the West?" "A great number of people sympathised with me in America — much more than in England. Vituperation by the low-caste misssionaries made my cause succeed better. I had no money, the people of India having given me my bare passage-money, which was spent in a very short time. I had to live just as here on the charity of individuals. The Americans are a very hospitable people. In America one-third of the people are Christians, but the rest have no religion, that is they do not belong to any of the sects, but amongst them are to be found the most spiritual persons. I think the work in England is sound. If I die tomorrow and cannot send any more Sannyasins, still the English work will go on. The Englishman is a very good man. He is taught from his childhood to suppress all his feelings. He is thickheaded, and is not so quick as the Frenchman or the American. He is immensely practical. The American people are too young to understand renunciation. England has enjoyed wealth and luxury for ages. Many people there are ready for renunciation. When I first lectured in England I had a little class of twenty or thirty, which was kept going when I left, and when I went back from America I could get an audience of one thousand. In America I could get a much bigger one, as I spent three years in America and only one year in England. I have two Sannyasins — one in England and one in America, and I intend sending Sannyasins to other countries. "English people are tremendous workers. Give them an idea, and you may be sure that that idea is not going to be lost, provided they catch it. People here have given up the Vedas, and all your philosophy is in the kitchen. The religion of India at present is 'Don't-touchism' — that is a religion which the English people will never accept. The thoughts of our forefathers and the wonderful life-giving principles that they discovered, every nation will take. The biggest guns of the English Church told me that I was putting Vedantism into the Bible. The present Hinduism is a degradation. There is no book on philosophy, written today, in which something of our Vedantism is not touched upon — even the works of Herbert Spencer contain it. The philosophy of the age is Advaitism, everybody talks of it; only in Europe, they try to be original. They talk of Hindus with contempt, but at the same time swallow the truths given out by the Hindus. Professor Max Müller is a perfect Vedantist, and has done splendid work in Vedantism. He believes in re-incarnation." "What do you intend doing for the regeneration of India?" "I consider that the great national sin is the neglect of the masses, and that is one of the causes of our downfall. No amount of politics would be of any avail until the masses in India are once more well educated, well fed, and well cared for. They pay for our education, they build our temples, but in return they get kicks. They are practically our slaves. If we want to regenerate India, we must work for them. I want to start two central institutions at first — one at Madras and the other at Calcutta — for training young men as preachers. I have funds for starting the Calcutta one. English people will find funds for my purpose. "My faith is in the younger generation, the modern generation, out of them will come my workers. They will work out the whole problem, like lions. I have formulated the idea and have given my life to it. If I do not achieve success, some better one will come after me to work it out, and I shall be content to struggle. The one problem you have is to give to the masses their rights. You have the greatest religion which the world ever saw, and you feed the masses with stuff and nonsense. You have the perennial fountain flowing, and you give them ditch-water. Your Madras graduate would not touch a low-caste man, but is ready to get out of him the money for his education. I want to start at first these two institutions for educating missionaries to be both spiritual and secular instructors to our masses. They will spread from centre to centre, until we have covered the whole of India. The great thing is to have faith in oneself, even before faith in God; but the difficulty seems to be that we are losing faith in ourselves day by day. That is my objection against the reformers. The orthodox have more faith and more strength in themselves, in spite of their crudeness; but the reformers simply play into the hands of Europeans and pander to their vanity. Our masses are gods as compared with those of other countries. This is the only country where poverty is not a crime. They are mentally and physically handsome; but we hated and hated them till they have lost faith in themselves. They think they are born slaves. Give them their rights, and let them stand on their rights. This is the glory of the American civilization. Compare the Irishman with knees bent, half-starved, with a little stick and bundle of clothes, just arrived from the ship, with what he is, after a few months' stay in America. He walks boldly and bravely. He has come from a country where he was a slave to a country where he is a brother. "Believe that the soul is immortal, infinite and all-powerful. My idea of education is personal contact with the teacher - Gurugriha-Vâsa. Without the personal life of a teacher there would be no education. Take your Universities. What have they done during the fifty years of their existences. They have not produced one original man. They are merely an examining body. The idea of the sacrifice for the common weal is not yet developed in our nation." "What do you think of Mrs. Besant and Theosophy?" "Mrs. Besant is a very good woman. I lectured at her Lodge in London. I do not know personally much about her. Her knowledge of our religion is very limited; she picks up scraps here and there; she never had time to study it thoroughly. That she is one of the most sincere of women, her greatest enemy will concede. She is considered the best speaker in England. She is a Sannyâsini. But I do not believe in Mahâtmâs and Kuthumis. Let her give up her connection with the Theosophical Society, stand on her own footing, and preach what she thinks right." Speaking of social reforms, the Swami expressed himself about widow-marriage thus: "I have yet to see a nation whose fate is determined by the number of husbands their widows get." Knowing as he did that several persons were waiting downstairs to have an interview with the Swami, our representative withdrew, thanking the Swami for the kindness with which he had consented to the journalistic torture. The Swami, it may be remarked, is accompanied by Mr. and Mrs. J. H. Sevier, Mr. T. G. Harrison, a Buddhist gentleman of Colombo, and Mr. J. J. Goodwin. It appears that Mr. and Mrs. Sevier accompany the Swami with a view to settling in the Himalayas, where they intend building a residence for the Western disciples of the Swami, who may have an inclination to reside in India. For twenty years, Mr. and Mrs. Sevier had followed no particular religion, finding satisfaction in none of those that were preached; but on listening to a course of lectures by the Swami, they professed to have found a religion that satisfied their heart and intellect. Since then they have accompanied the Swami through Switzerland, Germany, and Italy, and now to India. Mr. Goodwin, a journalist in England, became a disciple of the Swami fourteen months ago, when he first met him at New York. He gave up his journalism and devotes himself to attending the Swami and taking down his lectures in shorthand. He is in every sense a true "disciple", saying that he hopes to be with the Swami till his death.